Dr Cen Amores continues to be a high achiever as a community services hero in Sydney. Dr Amores is the current Chairperson of the Board of Management of Auburn Small Community Organisation Network Inc (ASCON), a board member of the Ethnic Communities Council of NSW Inc (ECCNSW) 2015 to present. The ECCNSW is the state peak body of all ethnic communities. She is also the Founding President of the Alliance of Philippine Community Organisations Inc. (APCO). ​APCO is famous as an alliance of about 40 autonomous organisational affiliates and hundreds of individual independent members throughout NSW. Photos above left: From left to right - New South Wales (NSW) Human Rights Commissioner Dr Tim Soutphammanase, Dr Cen Amores, Jose Musa, Former NSW Woman of the Year, and a Japanese Community Leader, May 2017. 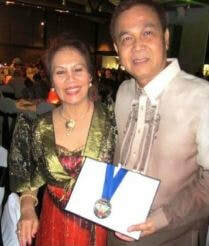 Above right: Dr Cen Amores with her likewise high-achieving and multi-awarded husband Ruben Amores. A fabulous husband and wife team community success story over many decades. Producer/Broadcaster of the Radyo Mabuhay on Community Radio (100.9 fm) in Sydney, 2013-14. Senior Vice President, PCC-NSW 2009. Vice Chair, Filipino Cooperative Inc operating the Hiyas Childcare. President, Ilocano Association of Australia. Chairperson, Membership Development Committee, Kapit-bahayan Coop Ltd (KCL). 1995-2015. Kapitbahayan coop is an outstanding 100% tenant-managed housing coop for low to medium income families in NSW. KCL is a 2016 Phil Presidential Awardee and 2012 ABS-CBN Global Bayani Awardee for being the most outstanding community organisation in Australia. ​​Appointed one of the 40 People of Australia Ambassador by the federal government under PM Julia Gillard. Only Filipina of the multicultural Ambassadors. The Most Outstanding Community Leader Award on Voluntary Capacity in 2013 ZEST (Greater Western Sydney community services annual awarding). GWS covers some 18 local government areas. Cen is still the only Filipina awardee. One of Women of the West Award by the University of Western Sydney in 2012 in celebration of the International Women’s Day - in recognition for the leadership and contributions made by Dr Amores to Greater Western Sydney. Fr Jose Burgos Award 2016 as an Outstanding Sons and Daughters of Ilocos Sur (for Outstanding Achievement in the areas of Education and Community Service in Australia) given by the Provincial Government of Ilocos Sur. Dr Amores is married to Ruben Florendo Amores. They currently reside in Auburn, Sydney, NSW. They proudly have three sons: Raphael, Brillo and Karlo. The Amores' Philippine residence is in Vigan City, Ilocaos Sur Province. Dr Amores was born in San Ildefonso, Ilocos Sur. RFA congratulates Dr Cen Amores for her big-hearted tireless community efforts and her many well-deserved community, state, national and international awards and honorary appointments. 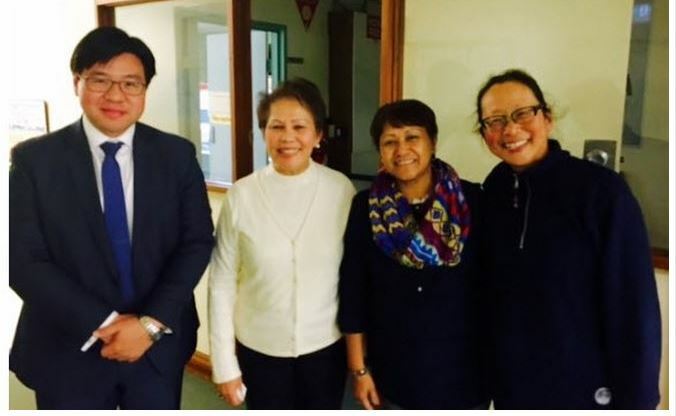 Dr Amores is a great success story and inspiration for Filipino-Australians as she has helped both her mother country in the Philippines and Australia with admirable skill, effort, integrity and spirit.